Three years ago, Wargaming launched World of Warships. To date, it has been played by over 28m people and boasts a development staff of more than 300. When the project started development, just 40 people were working on the game. This title followed in the footsteps of free-to-play MMO World of Tanks, the company's breakout hit that followed 12 years of iteration and persistence. Congratulations on reaching three years. What has this time working on World of Warships been like? World of Warships is the second-biggest title for Wargaming which means it comes with big expectations given that the company has been very successful in free-to-play gaming with World of Tanks. We have big goals to hit. In many ways, we do reach that in terms of the quality, the playerbase - the community is on par with anything we do. Development-wise, we went through a lot of changes in how we have developed and delivered the game. But the biggest challenge we have - and I don't think people notice this - is how often we deliver a patch. Until February 2018, we were delivering a patch every three weeks. That's huge for a title of our size and our playerbase, with a 50GB client. Those updates weren't just bug fixes - they were really content-heavy. It was starting to strain our delivery mechanisms so we shifted to four weeks. We still deliver a lot of content and then bring new content over and over again. It requires a very well-oiled machine to do this. What are the biggest lessons you have taken away from the last three years? It only depends on the lifecycle of the game. Initially, we just wanted to get the game out of the door and get the players in. Then as time passed, we understood who our audience was, what it would like, where people were likely to spend money and what they enjoy the most. The first year was all about understanding who our player was. Going forward, once we understood that, we could start creating content that appeals to that playerbase. A lot of the time we'd create content which we think the playerbase would love but in reality, it didn't enjoy it. It's learning live on iteration. We launch an update, keep an eye out for what people like and what they don't, then pull out a new idea board and start something new again. It's all about going out and understanding our audience. We know our audience now. If consumers play the game for three months, they're ours for a long time. A majority of our players have been playing since 2015. They've been playing for three years. The game is so sticky because we know now what they like, in what fashion we need to deliver it, as well as the pain threshold and what gives them joy. What did you think the audience would be when World of Warships launched? As a Wargaming title, we know who our audience is. But reality doesn't always match up with expectations. We more or less knew what our audience was, but when you go out, it turns out that it's not exactly the same. It has its own peculiar habits. Our playerbase, for example, is older than World of Tanks which is not something we expected. Our game is the most friendly game for grown-ups. If you don't have twitch reflexes but you still like to blow something up, this is perfect. It's a bit slower so you can take your time. It's forgiving. But if you want to master the game it requires hours and hours of play. Did you take many lessons away from World of Tanks? I can't fully disclose the internal learnings, but we learnt a lot in terms of architecture or the technology side. These games thrive on low latency and low ping values. We know how our data centres should be structured. It requires a lot of money and development to have a seamless the experience and start playing without consumers complaining about issues in the game. That's something we learnt from our big sibling in that regard. We already knew what the architecture should look like even though we aren't using the exact same tech. From a game development point of view, we did make some changes that we learnt from World of Tanks that didn't work for them. We loaned a few things from them - the UI is different but similar. If you play both games, you can tell they are both Wargaming titles, but we have made some changes to how the systems work, how the UX is handled, differences with the commander system. It's slightly simplified. But the battle UI is almost the same, even though World of Tanks is a land-based game so there are some inherent differences. We have tried to incorporate a lot of learnings from the game progression. 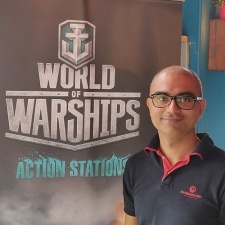 How do you approach developing with free-to-play in mind with World of Warships? Free-to-play is based on how many people are willing - that's the first thing. You need to make the game fun, first and foremost. If the game isn't enjoyable, it doesn't matter how much content there is or how many updates you do, it's useless as the game just isn't sticky enough. If it's fun, people will play. Once they are playing, it's about the mechanics of the game or how you present the game. For us, it's free-to-play but you can pay to progress. There are thousands of hours of content that consumers can play, but if they want to speed up their progression, they can pay. But even that is limited - users can't just skip through content and be on the top tier because that'll be pay-to-win. The amount you can skip is proportional to the amount you play. We won't allow players who join to skip to Tier Ten on Day One because that would destroy our game because experienced players would discover these people don't know how to play. Gamers play, they grind and then they can skip - if they want. As well as being on PC, World of Warships is available on mobile (Blitz) and is coming to console (Legends) in the near future. Can you tell me a bit about the process by which you bring the game and experience to different platforms? It's a challenge. The PC version is the mother title, as well as the most complicated. On the other end, you have console, which is simplified. We had to whittle down a lot of systems, especially with the UI and UX. Console players tend to play in a different style, so our battles are shorter with fewer people but you get into the action really fast. Mobile is on the complete opposite end of the spectrum where it needs to be an immersive experience, but it can't be at the same level as PC so the progression and fidelity are different. At the end of the day, it's about blowing stuff up in a sea battle. They're all made by different teams.